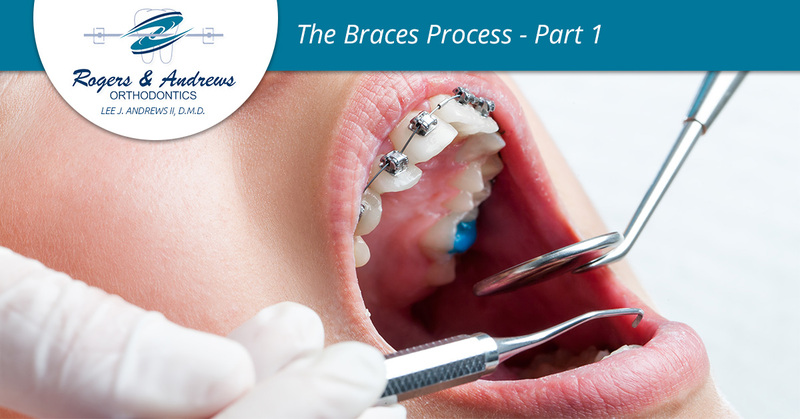 Whether you’re the one getting the braces or you have a child who needs them, the process can be a bit daunting if you’ve never been through it before. This is especially true because orthodontic treatment can take years. However, if you’ve found a great orthodontist, you’ve won half the battle! Orthodontists who know what they’re doing and make your interests a priority will do everything they can to make you comfortable, including making sure you know what is going on. At Rogers & Andrews Orthodontics, we work hard to keep our clients in the loop and feeling confident. Part of how we do that is sharing information, and we have some insights we want to share today! Though every office functions uniquely, there are some general steps to getting braces. In today’s blog, we want to share these steps so you not only know what to expect but can identify an orthodontist who may be trying to rush you along. You should never feel rushed by your orthodontist! Chances are good that you’ll attend a couple of these appointments with different orthodontists. While it can be tempting to go with the first specialist you see, you should visit a variety of orthodontists to get perspective. At Rogers & Andrews, we like to use the initial visit to introduce potential patients to our treatment philosophy, our office, and our staff. We also make sure that clients know how much treatment costs and what kind of payment options we have. We understand that confidence comes with knowledge, and that is why we take the time to answer every question our clients have. In order to fine-tune our treatment recommendations, we need to gather information on just what is going on with your teeth! We will likely take some x-rays and may make a model of your teeth. All of this information will help us put together a customized treatment plan for you. This may happen during your initial visit or at a second visit. During this visit, we will present our treatment proposal and give you the chance to decide if you want to go with it. You will have a chance to speak with our specialists directly and ask questions. If you’re ready to move forward, we’ll determine financial arrangements. At Rogers & Andrews, we accept many different insurance plans and offer financial arrangements that can suit your unique situation, so almost anything is possible! Once everything is good to go, we’ll make an appointment to put the braces on! In our next blog, we’ll dive into what that looks like! World-class orthodontics not only make for confident smiles, they protect your overall dental health. How? They ensure that your teeth can do their jobs correctly for years to come. At Rogers & Andrews, we are passionate about helping our clients achieve their best smiles. Contact us today!